Henri Matisse, known as the greatest colorist of the 20th century, was born in Le Cateau-Cambrésis, France and grew up in Bohain-en-Vermandois. He might have had a career in law, but after studying in Paris France and returning home to work as a law clerk, he started taking drawing classes in the mornings before he went to work. At 21, Matisse started painting during a period of illness and never looked back towards a career in law. In 1891, Matisse moved back to Paris to train as an artist. He learned at schools like Academie Julian and the Ecole des Beaux-Arts to study live models and copy the works of art masters. As he began traveling to places like London in the mid to late 1890’s to showcase his art work, he met Amélie Parayre. The two married in 1898 and eventually had three children. At the turn of the 20th century, Matisse’s work was showing the influence of Paul Signac and Georges Seurat, who practiced pointillism. Pointillism is a painting style that uses small dots of color instead of full brushstrokes. He started submitting his work for more renowned exhibits and garnered his first solo art show in 1904 at the gallery or art dealer Ambroise Vollard. During the same time, after Matisse took a trip to Saint-Tropez and to the Mediterranean village of Collioure, he started painting bright canvases that seemed to be bathed in light. He produced his major works like Open Window and Woman with a Hat during this time. An art critic who reviewed these paintings saw them as bold colors and distorted images, and wrote that he saw certain artists doing the same as Matisse. The critic nicknamed artists who exhibited this tendency “fauves,” or “wild beasts.” This label placed Matisse at the center of the Fauvism movement. Henri Matisse continued creating art works in bright, saturated colors that focused on capturing moods, limiting details and exaggerating lines for the rest of his career. What most people do not know is that he was not only a painter. He also created sculptures, prints, murals, book illustrations for limited-edition poetry collections, stained glass window design, pencil and charcoal drawings and other art that aligned with his most current paintings. There was a time in the early 1950’s when Matisse visited the United States. During his stay, he was approached by Alexander Smith, a carpet maker and owner of Alexander Smith & Sons Carpet Company in Yonkers, New York, to talk about translating one of his paintings into wool tapestry rugs. The discussion focused around a Matisse paper cut out collage that the artist had completed in 1949. Matisse revised the design in 1951 when Smith made the Matisse art carpet. 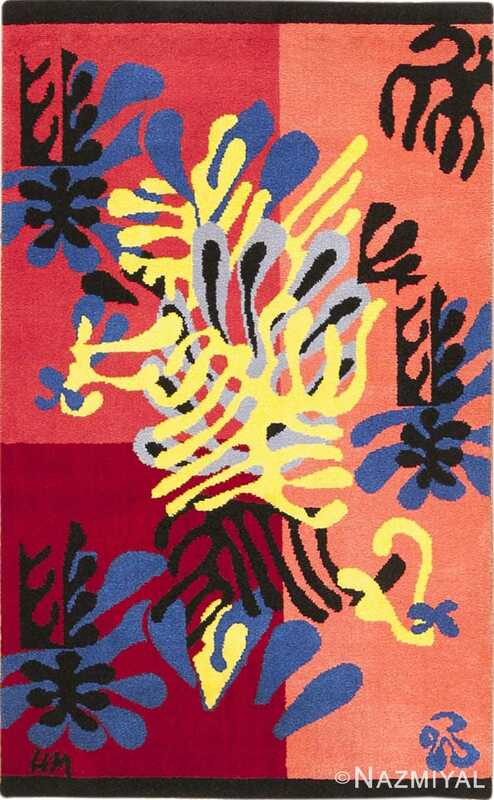 Smith made a limited edition run of 500 rugs, which Matisse called “the Mimosa rug.” Other artists of the time, including Matisse’s rival Pablo Picasso, had works translated into floor coverings, but Matisse’s Mimosa is the first and only pattern that Matisse specifically designed to be an actual area rug. The people who have inherited any of the 500 original rugs have connected them to very captivating stories. Nicholas Fox Weber, director of the Josef and Anni Albers Foundation, has recalled that his parents owned number 124 of the limited edition rug and kept it hanging on the wall in the entry hallway of their home in West Hartford, Connecticut from the time he was 4 years old. This was about two years before his death.